West on I80, past exit 52 watch for exit "Air Base Pkwy". Go east approx. 5.5 miles to main gate. You will see FamCamp on your right as you enter at Main Gate. Take two right turns to the office. Self check-in if office is closed. Accepted at least 30 days in advance, but no earlier than 90 days in advance. Reservations not accepted less than 30 days in advance. Sites not reserved are available "First come, first served." Available at Mitchell Memorial Base Library, Airman & Family Readiness Center, or Starbucks coffee at BX. WiFi also available in the campground for a fee. 1 day, $4.95; 3 day, $12.95; 1 week, $19.95; 2 week, $29.95 and 1 month, $49.00. Allowed in specified sites with usual leash (max 10') and clean-up rules. Not allowed outside unattended and must not disturb others. All animals must have current vaccination, be chipped and registered with the base vet clinic to stay at FamCamp and on Base. Must bring receipt from vet clinic to stay at FamCamp. Vet Clinic Phone # (707) 424-3010. 180 days per 12 months; Restrictions apply. Close to on-base shopping facilities. $5 dump fee for visitors. 5 MPH speed limit in campground STRICTLY enforced. OFFICE HOURS: 0830-1200 then 1300-1530, Mon thru Sat, Closed Sunday and holidays; Follow instructions on Check-in Board, Check out time: 11 a.m. Re-register space PRIOR to 10 a.m. on the date shown on your receipt. $10 late renewal fee applies after 10 a.m. Outdoor Equipment Rental, Passenger Terminal. We've been here for a month (November) and have had relatively no complaints about the park. 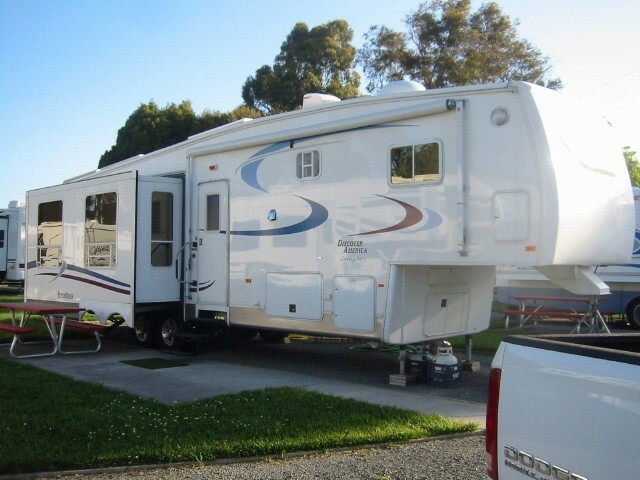 It is neat and clean and the sites are spaced well so you have plenty of room. All sites are back in and deep enough for any size RV and park your truck or car in front of the rig. The initial visual of the park is very nice with a section of the park that is landscaped and has some shade trees. This is the 'no pet' zone. As you come further back in to the 'pets allowed' area there is no landscaping or shade trees. The grass in the pet area, although watered regularly and maintained, looks dried up. There are some RV's in the pet section that are, well.....not the latest models and one even has a tarp over the top. But, that's okay. Not all people can have brand new Tiffins (we certainly don't). There is no wifi and, in this day and age, that is almost unacceptable. The park hosts are great people! Very helpful, very friendly and generally good folks. It's a small world in that we knew that we knew each other but couldn't place each other. We finally realized we had parked next to each other the previous summer in Rhode Island. Now we're all the way on the other side of the country and run in to them. The BX and commissary are very close by as is San Francisco, Sacramento and even Lake Tahoe is a nice day trip. We would come back. Stayed here for two full months and will be returning in a week or so for another extended stay, (getting Dental work done at David Grant). This RV Park is almost unnoticeable, (I'd been here numerous times over the years and didn't realize it's right inside the gate). Most of the spots in this park have seen better days as the grass has been let go, I believe due to the drought. The spots are gravel with a concrete pad with picnic table. There is cable, but for Wifi you must chose one of the options noted. Wifi at the Starbucks or exchange is extremely slow due to high usage. The exchange is large and the commissary is right across the street. There is a fuel station on base with a convenience store and Popeye's Chicken. Food court in the exchange and bowling alley also. You can't beat the price for full hook-ups and there is an RV wash station right next to the park. Hope this helps, safe travels. So disappointed! If you are traveling with pets, understand that you will be put in the ugly side of the famcamp. No green grass, no trees, and sites close together. For us, we were in the center which was not angle parking, too close to neighbor and nothing resembling camping. Very hard to maneuver 25' trailer when so many cars are parked limiting maneuvering. Bathrooms clean and check in manager was very helpful. But If you think this will be a 'parklike' camping experience, move on. There are clearly full time residents and a single wide mobile home. Not what we expected. We will not return. 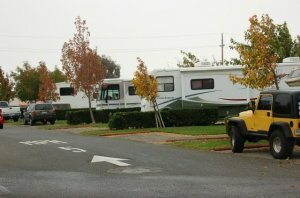 Nice campground, convenient location for seeing the SF/Sacramento area. Camp host was awesome. She made multiple changes to our reservation to accommodate our stay without having to move sites. Dog friendly park. Bathrooms were clean and the park itself was in pretty good condition considered how dry the area has been. Loved this campground. Central to all the Bay Area has to offer and the base facilities are great. We took the ferry out of Vallejo to SF and had a fantastic visit...and didn’t have to drive or park downtown! We were on our way to Alaska and I had an appointment at David Grant Medical Center so this was an ideal place to spend 10 days waiting for my appointment. We arrived without a reservation although I placed several phone calls and left messages. We were able to get a site and chose site #1 since we could stay the 10 days we needed. My wife ended up in ICU at David Grant and was subsequently transferred to California Pacific Medical Center. Stephanie worked with us to get us extended but we had to move to site #6. Stephanie also volunteered to walk our little dog since I am spending my days at the hospital. GREAT hospitality. Now the bad. The trees lining the drive need to be observed closely. See photo. Site #6 is horrendous to attempt to back into. There is a metal grate protecting the gas pipes directly in front of the site (across the road) that you need to be aware of if you are backing a 5th wheel in. I don't agree with the pet/no pet segregation and it has been addressed in previous posts. And there is a disparity between the upkeep between the two areas. Good location for daytrips around the area. PROS: Base BX/Commissary/Gas station with diesel. The camp host was very helpful with requests. CONS: I have never camped in a campground that segregated the campers with and without pets. 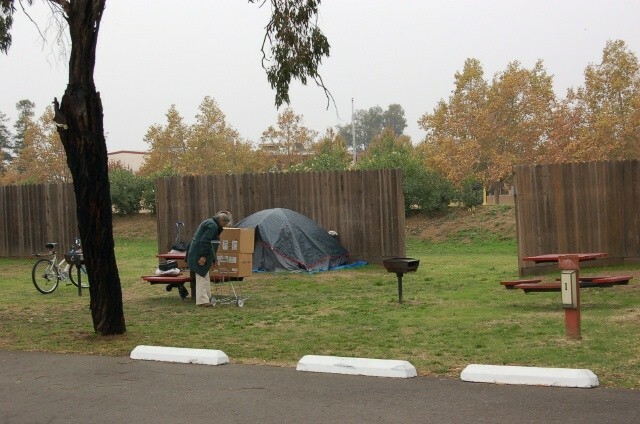 This is my first experience with segregated campsites at civilian or military campgrounds. It reminded me of the days of Officer vs Enlisted Country. Campers with pets are not allowed in the other area with their pets. It seemed the grass and general upkeep was better in their area also. Very disappointed in the Travis Command leadership for still having any segregated areas on base. Stayed this time for 3 days and I’m pretty sure this will be our last. The sites are very tight and hard to get into in some cases. We were again assigned to #62 even tough I have told the staff that this one isn’t very good for big rigs. Took a lot of jinking to back in our 40’ coach. When the slides are out on the street side you are butted right up against the hedge. Driving on the base has turned into a mess. The main gate is closed, the truck gate is only open as needed and the north gate is also closed. Everyone has to come through the Hospital Gate and maneuver around the very tight Jersey barriers the security forces have in place. A lot of folks don’t clean up after their pets and walk them trough the no pet area. The park no longer has Tengo internet and our Verizon signal was not very strong. There are a lot of homesteaders here. Some of the rigs in the park look like they haven’t been moved in a very long time. The price is right compared to the local area but I think we will go to the Dixon May Fair Campground from now on. We arrived at Travis AFB Famcamp on November 6, 2017 and planned on staying through December 3. This our 3rd or 4th visit to Travis and we always look forward to our stay. There is so much to do in the area; the Napa and Sonoma, San Francisco, Suisun City. What’s not to like. Much has also been said about the base, the proximity to the Commissary and Exchange, the Library and Fitness Center, so I will not repeat them here. One facility that I don’t believe has been mentioned is the David Grant USAF Medical Center. Shortly before we were to depart, I experienced a medical emergency that made it necessary to visit the ER twice and be admitted for surgery. I cannot make enough positive comment about the professionalism and care that I experienced. They were compassionate and caring and the outcome was excellent. They also picked up on another issue that they have been following. The staff of the Famcamp is excellent. Stephanie, Matt and John, the camp host, went above and beyond to extend our stay until I was released to travel by the medical staff. The facility, however is beginning to show some signs of deterioration. The interior roads in the park are deplorable. Pots holes make navigating the center road nearly impossible. There is a mobile home in the park that the manager lives in and while I understand that it is a great benefit, it has begun to show its age. The restrooms are clean and well kept. I find it interesting that the “best” sites are reserved for those with no pets. They have some amenities, i.e. hedges separating the sites that are not available in the main park. Nevertheless, a great place to stay and visit. We will return. We will miss reveille, colors and taps. Gravel RV parking area left us with ants in the RV. The FamCamp was clean although the doggie poop receptacle stayed full for over a week. Not an issue as there was a dumpster very near just started to smell. The rainbow eucalyptus trees are very pretty but also very messy make sure you sweep your slides off. Camp site is near the main gate and it seems Air Force Blvd doubles as a drag strip for those leaving the base. Kind of loud at times. There was no issue with age of RV nor were we questioned about the age. We enjoyed our stay and will return. 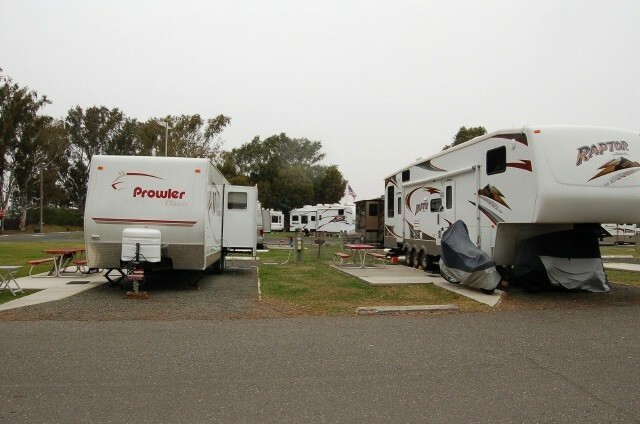 We're currently at the Famcamp and are located in the non-pet area of the RV park. Very nice since we get a very large greenspace behind the RV for our 3 yo to play in. Overall this is a very nice and well run camp. I've seen some comments on this site complaining about the pet restrictions and the RV age. To clarify, the pet restrictions are the same restrictions as having any pet on base. I would assume that most people would know that bringing pets onto a military installation is going to be a bit of a pain. When I stayed in billeting with my cats prior to retirement, they had to have all their recent vaccinations and the microchip. Another annoyance is the requirement to take any firearms you own over to the armory. But I was aware of this requirement prior to coming to the base so it wasn't a surprise at all...just an additional task. 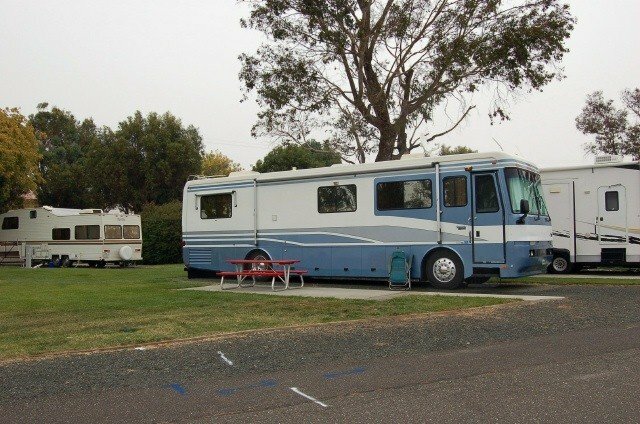 Another issue that people have brought up is that they are banning RV's that are too old. I decided to take a look at the requirement and it DOES state that only RV's 1995 and newer are allowed in the park. 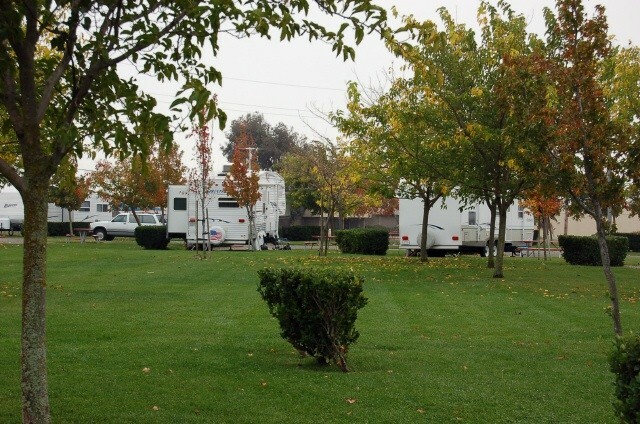 That being said, their was also a note that stated that older RVs could stay at the RV park at the manager's discretion. I believe they're just trying to keep the hobo RVs out of the park. Nicely maintained older RVs should be fine. Pros to this park: Very nice green space; proximity to BX and Commissary; close to the main gate and easy to find; well maintained facilities (Laundry/Showers/Toilets); free ice bags; lots of green space; price Cons: 0700 Reveille (oh dear god why did we stay here)..it appears one of the speakers is rather close to the RV park; Noisy cars (I think this is a CA thing but at times I feel like there's a racetrack nearby); Have to have firearm secured in armory; it appears that there are quite a few homesteaders in here (not sure how that works as they can only stay 90 days out of a 180 day period). 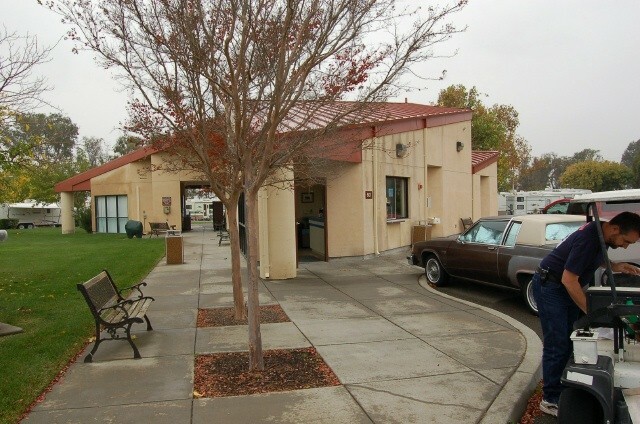 Overall this is a great RV park and would certainly stay here again if we happen to be in the area. The site is gravel and level. I did not have reservations as they do not make reservations if you are going to arrive within 30 days; however, they do have several sites that are first come first serve. When I arrived the office was closed but there were clear instructions on which sites were available for my size rig, length of stay, and with or without pets. I don't think it could be any more clear. After I got settled in my site, the office opened and I finished the registration process. The gentlemen in the office was friendly and squared me away quickly even though he continued to receive a million other calls. Kudos to him for his multitasking abilities. The BX and Commissary are within walking distance and there is a big field in the back to walk your dog. Overall, I have no complaints especially for the price. Thank you Travis AFB Command and MWR for taking care of us. Now... if we can only get everyone (mostly a small percentage) to recognize theses awesome benefits and not take advantage and ensure we clean up after ourselves and our pets. If you have pets or a pre 1999 RV BEWARE!!!! The rules now state: Pets now must be microchiped and registered with the base vet No RV's 1999 or older are permitted in the park. For those reasons I really dropped the hospitality score. People do not clean after their pets. Pets left outside and bark a lot. People do not follow laundry room. 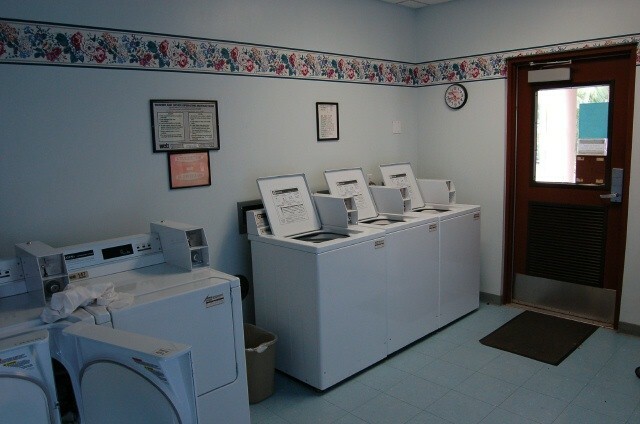 Washing pet items in laundry facility. Didn't stay this time. Called today for a reservation and was told that they aren't accepting reservations until 1 April. When I told the lady on the phone that I thought they accepted reservations 30a days prior to arrival she told me that due to the amount of folks already there they couldn't honor my request. Don't have a clue what the folks that are already in the park have to do with not taking a reservation. I think they need some adult supervision out there. 1st stay: Arrived at 1:45 PM on a Thursday. Brochure, phone message and sign on the door all say the office is open from 0830-1200 then from 1300-1530. My wife went to the office where an Open sign displayed in the window, knocked on the door but the guy in the office would not answer. She then called the office number and he finally acknowledged her. When we made reservations a few months back I asked for a parking site where we could get satellite reception. Amy assigned us to site #3 for that purpose. During check-in we were told we had been moved to site #61 which we knew has a tree blocking to view to the south. At that time we were told there was no other sites available so we proceeded to our site, backed in and with some maneuvering, got the TV working. When my wife walked back over to the office she was told we could move to another site if we wanted. What? So, if you are assigned to a site or make a request for a specific site when you make a reservation, you may or may not get that one when you arrive. My recommendation would not even assign a site when you make a reservation, just wait until your arrival. During check-in you are required to not only sign the “rules” sheet but you must now initial all 21 rules individually and then sign. I don’t think we got the memo that Tony has returned to Travis. There in no longer any internet available in the park and if you want cable TV you are required to go into Fairfield to get a cable box. They are no longer watering most of the “dogs” parking sites and it looks terrible in that area. 2nd Stay: Arrived on at 11:25AM on a Friday. Same problem with being moved to another site. Don’t get me wrong, I don’t mind being moved but at least take my preferences into account. The Verizon cell signal is weak at Travis but with a booster we are able to get 2 bars of 4g service. This is a great location and affordable for the area. You can't beat staying here and driving into San Francisco. Free Jelly Belly tour not too far from the base.Laundry and grounds were clean. There is a large field near the famcamp to walk your dog. A big plus to visit San Francisco ,Sacramento and Lake Tahoe. All with in a few hours drive. Level sites close the BX and Comissary. Can't beat $20/ nite. Definitely good for return trip. Arrived this time without a reservation and got a site in the "non pet section". Used our Frequent Camper coupon for a free night. Rule #20 has been added since our last visit, "1995 or newer campers only!!!!!!!!!!!!!!!!!!!". Very weak Verzion cell reception but we were able to get a DTV satellite signal in Site 70. Make sure you put pads under your leveling jacks as per rule #2. Pet owners, this has been put in the brochure: "All animals must have current vaccination, be chipped and registered with the base vet clinic to stay at FamCamp and on Base. Must bring receipt from vet clinic to stay at FamCamp. Vet Clinic Phone # (707) 424-3010." Don't know if management is enforcing this rule or not.